Hello my name is Georgia Bates, I am 17 years old and studying L3 equine management at kirklees college. I thought this was a great opportunity to extend my knowledge and learn how other cultures manage a variety of animals. During the project I have been volunteering at the dog groomers, vets and the donkey sanctuary. At the sanctuary I undertook husbandry tasks as well as treating injuries and ailments. 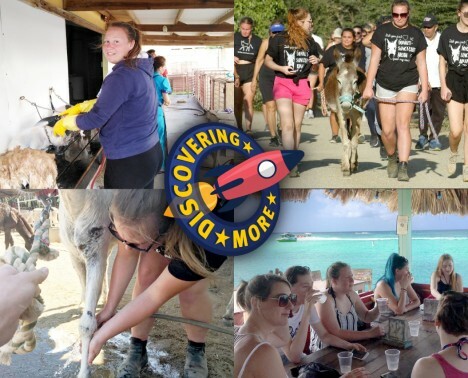 We also got free time between volunteering, which we used to visit sites and complete activities such as horse back riding, water sports, snorkeling and visit local beaches. Thanks to erasmus+ professionally I learned how to prepare animals before surgery and got a basic understanding of vetenary practice. Personally, I have enjoyed the project and developed a number of new skills which I can apply to my college course. I also feel more confident around new people due to this experience. Vocational Educational Training (VET) project part of ‘Discovering More’, co-funded by the Erasmus+ programme of the European Union.